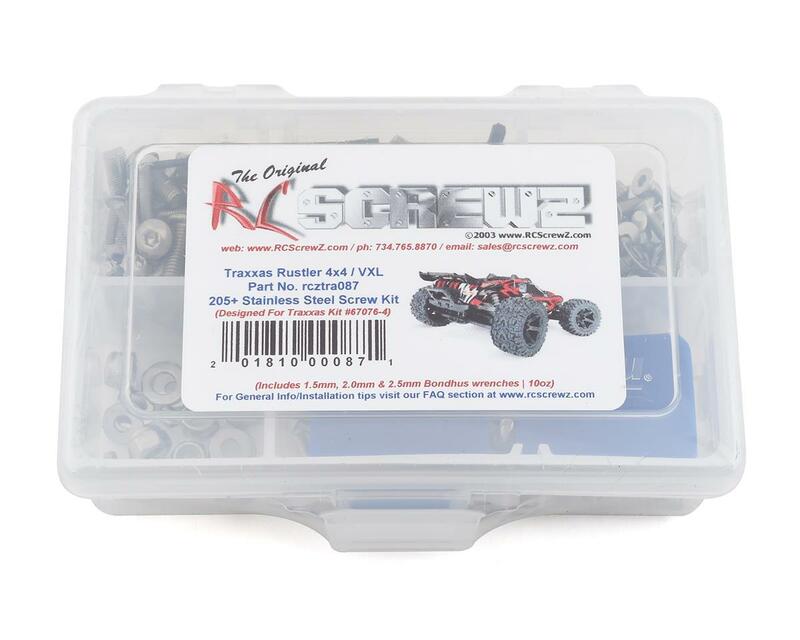 This is a optional RCScrewz Stainless Steel screw kit for the Traxxas Rustler 4x4/VXL. RCScrewz Stainless Screw Kits are 100% complete. Your kit will include everything needed to do a full conversion and more. Stainless Steel Screw Kits are far superior to the screws that come stock with your RC. RCScrewz kits are made with the best stainless steel money can buy. No more bent, rusted, or corroded screws. Never worry about stripped heads again. You will not find a better screw kit for your RC at any price and RCScrewz Guarantee's it. If for any reason your not 100% satisfied with your kit, return your screw kit to RCScrewz and they will send you a full refund for the price of the kit. Rustler 4x4 (67076-4) Traxxas flat cap screws (ex: 3931/4859) are patent pending and are replaced in this kit with correct diameter button heads and/or low profile cap screws depending on location. Also all barrel/shank type screws (ex: 3642x/3967/67726) are also patent pending parts and have machined collars and are considered threaded pins and not screws. Use either a wax or grease on the threads to help prevent stripping while going into new or hard material. Some screws that are included in the these kits remain phillips heads but are still stainless steel. This has been done for strength, as a result of field testing, on small diameter screws (2mm and 2-56" dia). This may include some chassis screws and differential screws. All other remain socket head. Please refer to your assembly manual for screw locations.